Our recent blogs have discussed some of the most common reasons to visit your dentist for restorative and cosmetic treatments. Find out more about oral care and cosmetic dentistry at the recommended links below. For an appointment to discuss the health of your smile, contact Dr. John Carson, DDS at (520) 514-7203 or on our website. The American Dental Association website can help you prepare for a root canal procedure. Learn how some sports drinks may increase your risk for tooth decay with this CBS article. WebMD.com can help you understand the causes of tooth discoloration and the options you have for tooth whitening. See the results you can expect from gum contouring at Perio.org. Invisalign.com offers some facts to help you decide if invisible braces are right for your smile. 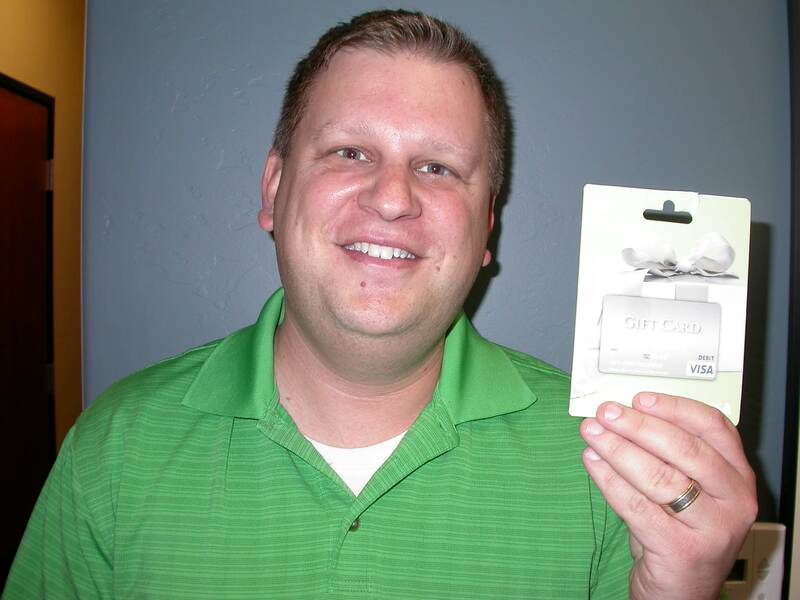 Congratulations Adam K. our June 2012 $100 Winner! Every smile is unique, so achieving an aesthetically pleasing smile requires a personalized treatment plan to address the specific flaws that bother you. One way to boost your smile confidence is to seek treatment from an experienced cosmetic dentist. Crooked or misaligned teeth: Orthodontic issues are not just a problem among children. Sometimes adult patients can require further care because their teeth have shifted back to their pre-orthodontic positions. Orthodontic care may also be necessary for adults who never received previous correction. In either case, Invisalign clear braces can straighten the teeth without any embarrassing metal brackets or wires. Yellowing teeth: Staining from food, smoking, and aging can lead to an unpleasant, yellow grin. That’s why tooth whitening is one of the most popular cosmetic dental treatments around today. A combination of in-office procedures and home use kits are available to remove stains and improve the color of the teeth by several shades. Gummy smile: If you feel that your smile shows off too much of your gums, you can alter that problem with gum contouring. This cosmetic procedure will provide you with a more pleasing ratio of tooth and gums in your smile, so you will want to show it off more often. Chipped or missing teeth: Restoring teeth that have been damaged or knocked out is important to the aesthetics and the health of your smile. Treatments like veneers and dental implants can work to restore the natural appearance of the affected teeth while improving the functionality of your bite. To start planning your smile transformation with the cosmetic procedures discussed above, schedule a consultation with Dr. John Carson, DDS. Our Tucson dental practice is dedicated to balancing health and beauty in our patients’ smiles. Contact us on our website or call us at (520) 514-7203. Preventative measures like at home care, regular dental cleanings, and exams can help to identify tooth decay and slow its progress. However, if decay goes unnoticed and untreated, it may eventually reach the roots and nerves inside of your teeth. As this video explains, when tooth decay penetrates deep enough, the nerves in the canal of the tooth roots can become infected. Patients suffering from an infection may experience pain and sensitivity in the area. Typically a root canal is the appropriate treatment for tooth decay of this severity, where the nerves are affected. If you have pain in your tooth, find the source and get proper treatment with Dr. John Carson, DDS. Schedule an appointment in our Tucson dental office by calling (520) 514-7203 or visiting our website. Along with restorative procedures to revive your smile, we offer cosmetic and preventive services. Plaque and tartar build up on the tooth: After you eat, residual food particles can remain tucked away on areas of the teeth where they mix with saliva and bacteria. As a result, plaque, a sticky film substance, forms and adheres to the teeth. Tooth enamel is worn down: When plaque and tartar accumulate on the surface of the teeth, they break down the tough outer enamel that protects the softer tissue beneath it. Decay penetrates deeper into the tooth: If cavities in the enamel remain unidentified, the decay will keep digging deeper into the tooth structure. Eventually, decay will reach the tooth pulp, which contains nerves and blood vessels. When tooth decay reaches this point, pain and sensitivity will be fairly severe. A root canal is a treatment for advanced tooth decay that has reached the pulp of the tooth. Because the pulp is exposed, the nerves need to be removed to eliminate pain. This procedure cleans the middle cavity of the tooth, which is then filled. Finally, a crown is placed over the tooth for stability. You can prevent the need for this type of treatment by visiting your dentist for regular check-ups. Regular cleanings and dental x-rays and exams will help to prevent decay and identify early signs of a problem. Less invasive treatments like cavity fillings or changes to your oral care routine can stop decay before it progresses to an advanced stage. To keep your teeth strong and free of decay, schedule a cleaning and exam with Dr. John Carson, DDS at his Tucson dental office. Call (520) 514-7203 and our staff will provide personalized and compassionate care to help you achieve a healthy smile.